Your Downtown Dentistry offers In-Office Teeth Whitening with amazing results. We are so confident that you will get the best results you’ve ever had that we guarantee immediate results and 100% satisfaction with a no questions asked money back guarantee if you are not satisfied for any reason. Your Downtown Dentistry provides a professional and safe procedure that is unlike any other whitening product on the market. In comparison to many other topical processes and remedies that only cover up an individual’s enamel stain, the in-office whitening system utilizes advanced blue light technology that safely opens the pores of the enamel to gently remove and lighten the stain from within. Remarkable and dramatic same day results that can make an immediate difference in the individuals overall smile and appearance. This innovative process is clinically proven to last up to 8x longer than any other whitening remedy currently available. Professional tooth whitening is also able to brighten the area of your teeth closest to the gums, and even the spaces between your teeth, which over-the-counter whiteners are unable to reach. Laser tooth whitening will restore your teeth to your teenage level of white, but it’s up to the patient to keep them that way. You should come in to Your Downtown Dentistry at least twice a year for a professional cleaning so temporary stains from coffee, tea, etc. can be removed before becoming permanent. Naturally, you should brush your teeth and floss twice a day to reduce future staining from food and drink. Your Downtown Dentistry provides the best teeth whitening results and best customer experience by utilizing the highest quality award winning equipment and individualized processes tailored specifically to your teeth to achieve amazing results for you no matter what staining you have. If you are unhappy with your smile for reasons other than discoloration, professional whitening may not be sufficient to help you achieve your desired smile. Teeth whitening cannot correct crooked teeth, decayed teeth, chipped teeth, or broken teeth. During your initial consultation, Orlando cosmetic dentist Dr. Behzadi may recommend that you have additional restorations performed on your teeth before professional tooth whitening. Like at-home whitening systems, professional teeth whitening may cause sensitivity in some guests’ teeth. To keep your smile as white and gorgeous as possible, it is important to follow up with Your Downtown Dentistry teeth whitening session with regular maintenance and strong oral health. To learn more about professional teeth whitening or to make an appointment to make your smile brighter and whiter, please call (407) 502-0202 or contact our Orlando cosmetic dentistry office today. 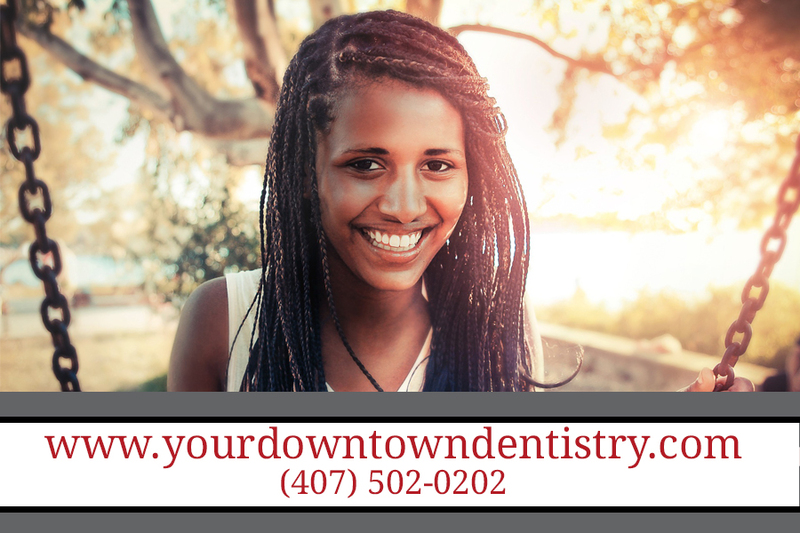 Your Downtown Dentistry is proud to serve Orlando and surrounding areas of Central Florida.